Calcium, Iron, Protein & More! 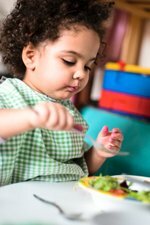 Concerned your toddler won’t eat 3 full meals? Don’t panic – most toddlers will only eat between 1 to 2 “meals” per day. Yes, it is true and it’s perfectly fine. If you think that your toddler should be eating a full meal at each mealtime, take heart – your toddler won’t eat 3 “full” meals and further, does not need to eat 3 “full” meals per day! What your toddler does need is at least 1000 calories per day, according to the AAP. My Toddler does not eat at Dinner! You will notice as the day progresses that your toddler becomes less and less hungry. Rest assured, it is common for toddlers to eat great at breakfast, eat “ok” at lunch and come dinner time, your toddler may eat either miniscule bites or leave behind a 99% full plate. The AAP ( ) recommends that children age 1 to 3 years get about 40 calories per inch of height a day. Translation: Your 32-inch-tall toddler ideally should eat about 1,300 calories a day for normal growth and weight gain. These calories should come from the sources listed below as shown in the apple. So what does this mean for My Toddler? 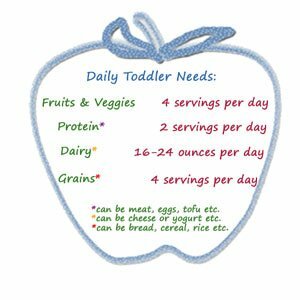 Your Toddler does NOT need to eat as much as you think he/she does! Medical Professionals will tell you – children grow more slowly after the age of 12 months. Hence, their caloric needs are lessthan what they were during the rapid growth period of newborn to 1 yr. old. offerings, especially during snack time, will help you to overcome the inevitable lack of food intake during a meal. Offer your toddler the opportunity to choose what he wants to eat for 1 or 2 meals during the day. Allowing your toddler to make his food choices will help teach him about the importance of healthy foods and diets. For example, if your toddler does not drink all of his milk at breakfast, give him cheese for a snack. If your toddler refuses to eat his meat at lunch, give him tofu bites dusted with Cheerio or Granola crumbs for a snack. In these examples, while you may lament at the lack of calcium and protein intake during breakfast and lunch, you have taken the opportunity to “make up for it” during snack time! Toss out the idea that your Toddler will suddenly be eating “like the family” does! Remember, your Toddler is still in a stage of slow-then-rapid-then-slow growth and is going through many changes! How Much Should I Try to Have my Toddler Eat per Day? 4 servings of fruits and vegetables. (Serving size: one tablespoon per year of age.) One serving should be high in vitamin C and another in vitamin A. 2 servings of proteins – meat, beans, eggs, tofu, or peanut butter. A good serving of protein should be served at every meal. One serving equals 1/2 ounce. Courtesy of Parent’sPlace Nutritionist Q&A. What is Considered a Serving Size for a Toddler? At the next meal, use these measurements exactly and see for yourself how little food a Toddler should actually be eating. We bet you will be quite surprised! © Copyright 2005-2018 wholesometoddlerfood.com. All Rights Reserved. Information in this website is not meant to be taken as medical advice. Contents of this website are copyright protected and may not be reproduced for any use, of any kind, without the express written consent of wholesometoddlerfood.com.